The month of May is a time when we honor our fallen heroes and feel a special appreciation for veterans and those currently serving. So, we want to make sure our troops are given every career opportunity available to them at home! If you are active military personnel or a veteran of the United States Armed Forces, you can use your GI Bill to receive a state-of-the-art education and hands-on training at United Truck Driving School in Murfreesboro, TN. There are so many reasons to use your GI Bill to become a truck driver, but we’ll focus on the top three. In today’s economy, jobs are no longer a dime a dozen…unless you’re a truck driver. Our nation needs truck drivers to function at the pace it has become accustomed to running. As a truck driver, you’ll experience a stable job market and enjoy having a job that the world relies on. When you use your GI Bill to become a professional truck driver, you’ll have peace of mind knowing that you’ll have access to a job upon graduation. From a steady salary, to insurance opportunities, to starting a 401k option, professional truck drivers experience amazing benefits. There’s nothing better than a stable job with benefits! Whether you are providing for your family or starting your career, these benefits will position you for a spectacular quality of life as a truck driver. Can you see yourself sitting behind a boring cubicle for the rest of your life? Probably not! As a professional truck driver, you’ll experience life on the road and a truly hands-on employment opportunity. 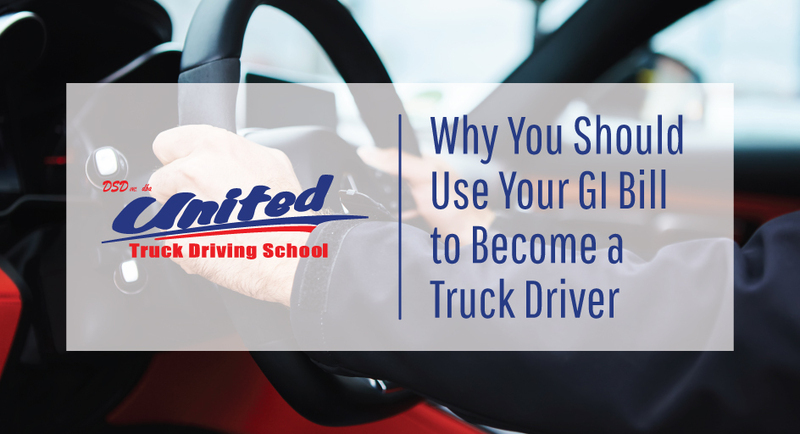 Since United Truck Driving School accepts the GI Bill, you’ll be happy knowing that you will have a job you enjoy! What are you waiting for? United Truck Driving School is ready to accept your GI Bill and get you and other veterans on track to become successful truck drivers. Our top-of-the-line training facility in Murfreesboro, Tennessee is exactly what you need to get started on your new career! Contact United Truck Driving School today to learn more about using your GI Bill towards your CDL Class A education and training.